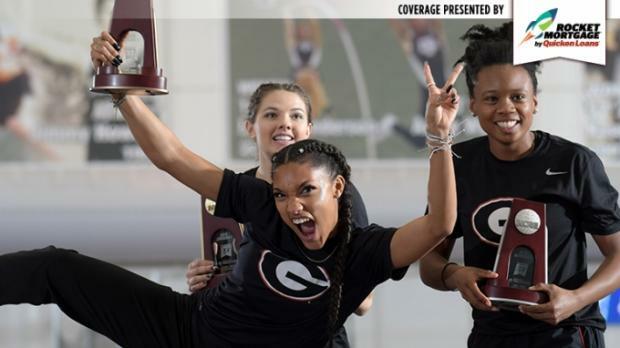 COLLEGE STATION, TX -- The University of Georgia women have never won an NCAA team title in track and field, but that could change this weekend at the NCAA DI Indoor Track & Field Championships, where the Bulldogs currently lead all other teams by 20 points going into the final day of competition on Saturday at Texas A & M University. A few historic things went Georgia's way on Friday, including a sweep of the women's long jump by Kate Hall, Keturah Orji and true freshman Tara Davis, a feat which no other men's or women's trio from a single program has ever managed. DAWGS MAKE HISTORIC SWEEP OF THE LONG JUMP! Hall sealed the victory on her very first jump, a solid 6.56m/21-6.24 mark which no one else in the competition would surpass. Her next two jumps though included two consecutive indoor PBs: 6.69m/21-11.5 and 6.73m/22-1, the latter of which set a new school record and would stand as the winning jump. Orji's best mark was 6.52m/21-4.75, and Davis claimed third with a final jump of 6.50m/21-4, a new personal best. While Davis' surprise bronze medal-winning performance was an impressive boost for the Bulldogs, as she was only fifth at SECs, her hurdle prelim immediately before her final long jump broke a world record. The California native ran 7.98 seconds --a huge improvement on her prior best of 8.03-- to set a new world U20 record in the event. The prior world junior record was 8.00, set one year ago by Klaudia Siciarz of Poland. Davis is also the second-fastest qualifier to this evening's final after Arkansas' Payton Chadwick, won ran 7.93. She defeated NCAA leader Jasmine Camacho-Quinn in her heat. When the Bulldogs earned consecutive runner-up team honors at the 2017 NCAA Indoor and Outdoor Track & Field Championships, they were a field event specialist team. This season, the introduction of freshmen Davis and Lynna Irby, who is the top seed in the today's 200m final and No. 2 in the 400m, as well as the development of distance runners like Jessica Drop, who earned a surprise fourth-place finish in the 5K last night, have made the Dawgs a more complete team. Can the Bulldogs make history in College Station?